With their design for the historical archive for the Basque country (“Archivo Histórico de Euskadi”) ACXT Architekten have closed a gap left in an otherwise dense residential block in Bilbao. Living and archive work are two uses that complement each other, just as the bright new build melds with the existing frontages. 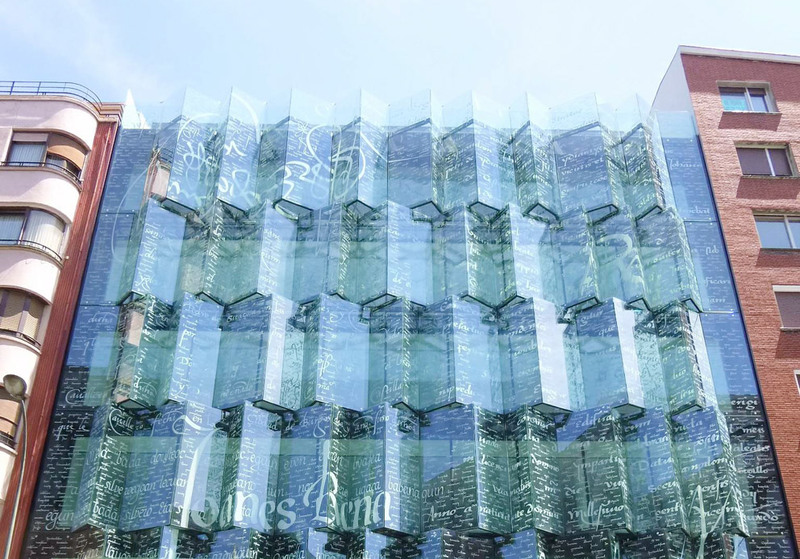 And to give visitors a taste of what is to come inside the archive, the architects resolved to have the strikingly zig-zagging glass façade printed with quotations from the collection of documents. What the visitor cannot intuit from outside, however, is that the building has a total of 11 floors, seven above the ground, housing the administration, the reading rooms and the exhibition space. The other four are underground and home to the storage rooms for the extensive collection of historical documents. To make certain as much daylight as possible gets into the rooms, the floors are connected to one another by a central high atrium. Broad lighting shafts located in the rear courtyard ensure that even the corridors in the underground sections still benefit from natural lighting. The walls are resplendent in gleaming white and only in a few places is there fresh red or yellow to create a color accent or two. Where natural daylight no longer suffices, luminaires by Prolicht provide the right degree of brightness. For the conference rooms and offices, the architects chose rectangular flush-mounted ceiling luminaires from the “White Line” range. They ensure plus- 3300 Kelvin brightness for the workstations, a color temperature similar to daylight and an ideal precondition for focused work. 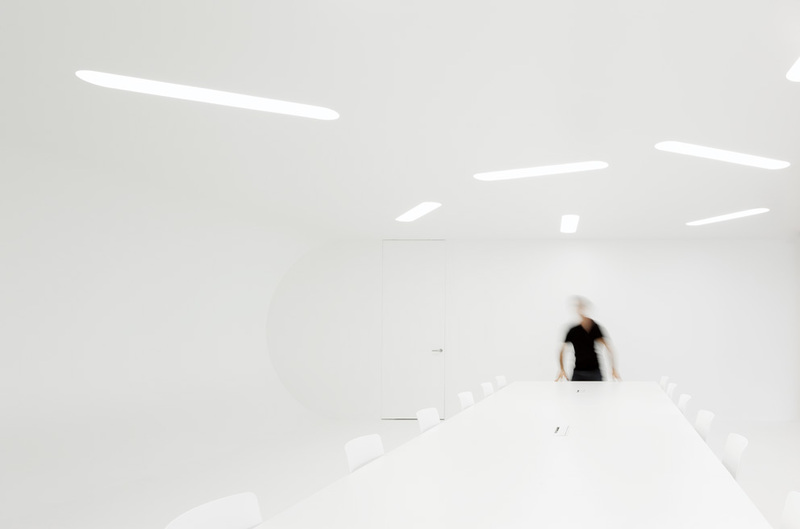 Prolicht’s “Smooth Line” with rounded edges, arranged in asymmetrical patterns on the ceiling, brings a little diversity to the otherwise minimalist design of the conference rooms. 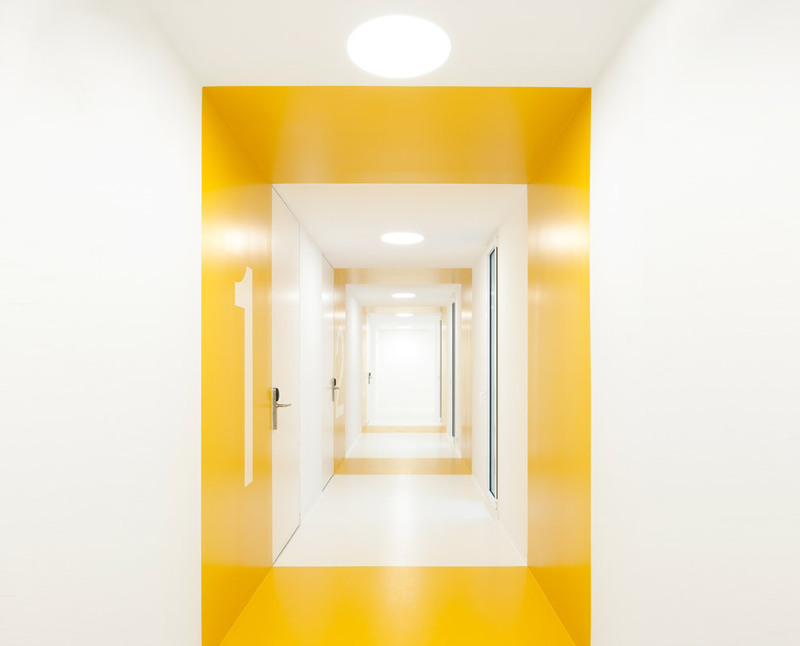 Round flush-mounted luminaires from the “Sign Round” range, installed smoothly in the ceilings of the archive corridors and the underground carpark, rely on a high-grade diffusor to diffract the direct light while evenly illuminating the in part long paths.